I promised you an update on what we'll be reading for my Barth seminar this semester. Thanks for all the great suggestions, both here and on Facebook. 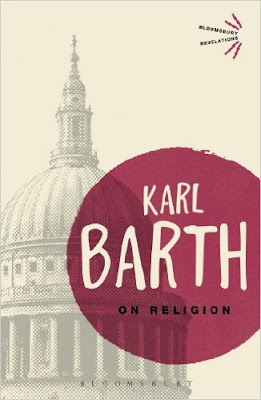 After much reflection and dialectical hesitation and whatnot, I decided to head off in a slightly different direction, and that is to make Barth's concept of religion a focal point for the seminar. I think this helps to cover a lot of bases. It allows us to read both the Romans commentary and an important section of Church Dogmatics, while keeping strong thematic links across the semester. And it opens up some of the most important areas of Barth's thought (e.g. revelation, election, grace, the task of theology, the critique of protestant liberalism on the one side and Roman Catholicism on the other, etc). In a perfect world we would also have time to read Barth's "doctrine of the lights" from later in the Church Dogmatics. But, ladies and gentlemen, last time I looked out the window it was not a perfect world. 1 Revelation: "The New World in the Bible"
2 Dialectical theology: "The Word of God as the Task of Theology"
Students will be required to write a first paper exploring one particular chapter from the Romans commentary, and a second paper that explores one of the larger themes in these texts. If anybody from the Sydney area would like to come along and join us, the seminar will be on Tuesday afternoons, commencing early March. Non-fee-paying audit participants are always welcome!